With the N3TC Drak Challenge having come and gone, the paddlers on the Elite Athlete Development Programme are now targeting the country’s premier canoe race the FNB Dusi Canoe Marathon later this month. The FNB Dusi takes place over three days from 14 to 16 February and is a race that includes a number of portage sections where paddlers must run with their boats which adds to the demands of the 120km journey from Pietermaritzburg to Durban. Among the EADP paddlers that will be taking on the Dusi this year there are two former winners in the form of Hank McGregor and Sbonelo Khwela, although Jenna Ward and Banetse Nkhoesa will be hoping to push for a podium finish. McGregor won the 2018 edition of the race with former EADP star Andy Birkett in their K2 and with this year being a K1 championship race it is going to be an exciting solo contest with a number of paddlers in with a podium shout. 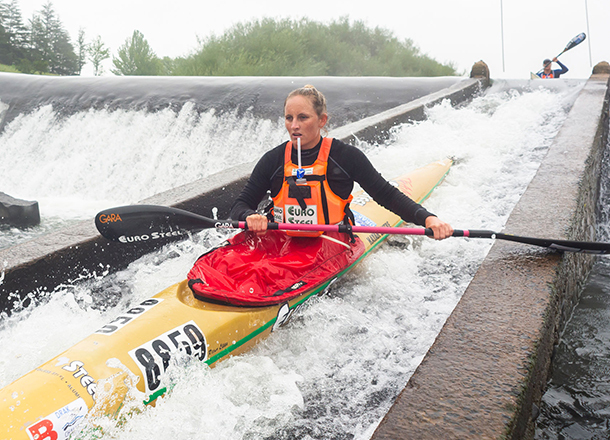 Euro Steel’s Ward has come to realise that the Dusi plays a crucial role in her yearly preparation and will not miss the event because of the importance it has for her flat-water marathon build-up. “The Dusi always gives me so much in terms of training for the rest of the year,” the former World Marathon Championships silver medallist said. “I want to paddle all disciplines this year, river marathons, flat-water marathons as well as surfski so I use the Dusi as a great base for the rest of my racing. 2019 will be another big year for Ward who is targeting a big push towards the ICF World Marathon Championships later in the year and with her trainer Jarryd Rudolph at Prime she has changed things slightly for this year. “Going into Dusi I have focused a lot on my running but have also incorporated that with my paddling so not doing individual sessions but rather two hours of running and paddling together. “I get down to Prime twice a week and Jarryd knows what we are trying to achieve so I trust him completely. From a men’s perspective Euro Steel/Red Bull’s Sbonelo Khwela seems to have taken a different approach to his preparations for the 2019 race. Following a podium at Sunday’s Super Bock Campbell’s to Dusi Bridge race he is starting to peak at the right time. He spent the large part of the build-up to Dusi using the qualifying races as training and wasn’t in the top three for any of the races until this past weekend. Euro Steel’s McGregor made an early appearance at the 50 Miler but hadn’t been seen since until he finished third on Sunday.